Don't let the mummy wake up! My First Game Jam: Summer Edition community · Posted in The Playtesting Thread! Is the rhythm-but-not-musical platformer mechanic fun somehow? Is this a good idea for the gameplay? Are there too much stuff happening on the screen? Would it be better to change the game to have more focus on the actual gameplay part (the center)? Any other comments about the game are welcome. Note: the art is a draft and I know it lacks a proper difficulty system. OMG! I think I've finished it! So I've decided to keep the name. Maybe Lucas will enhance the art, I don't know yet. It took almost an afternoon and the whole night, but gives very proud to see everything working! Now it only remains us to do: the score, the start screen and the artwork. Lucas just sent me the new drafts and I'm so glad to see it! Now it can jump by itself! Struggling with lack of time and problems involving inheritance in GML. I've updated the first post with a brief description of the game. Being a developer of beginner games is to have outlandish ideas and then go cutting the edges to get a design that is fun to play. 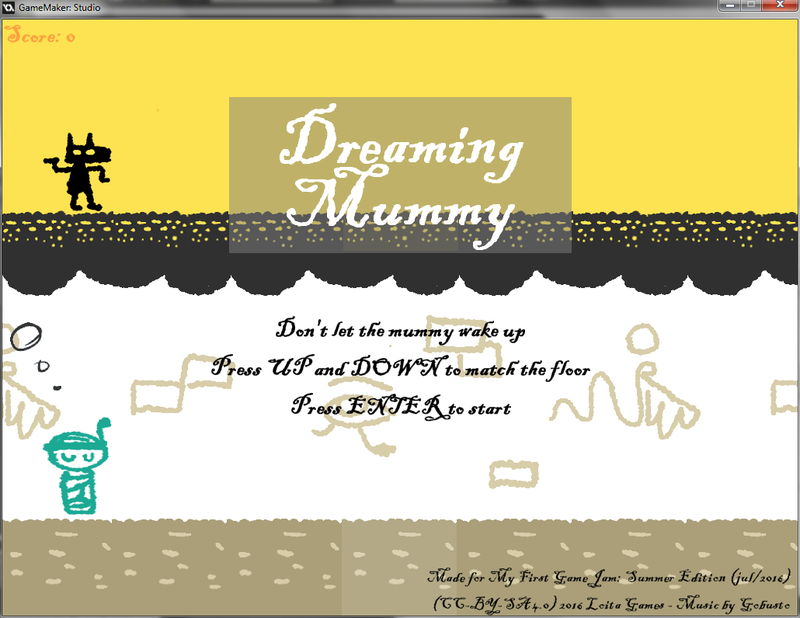 The idea that I had for the Jam is a platform game about a sleepwalker mummy with a few pinches of personal creativity. As soon as I know I can do what I want to do, I will reveal what else is included in this "personal creativity". It's a bit boring having to learn all the engine's operating logic, dealing with uncertainty about being the idea is possible or not, but it's fun to learn through mistakes. PS: Sorry for the translation errors, I had to use Google Translator a bit. It is the first Jam I participate, as well as my buddy Lucas, who has a talent for graphic arts. 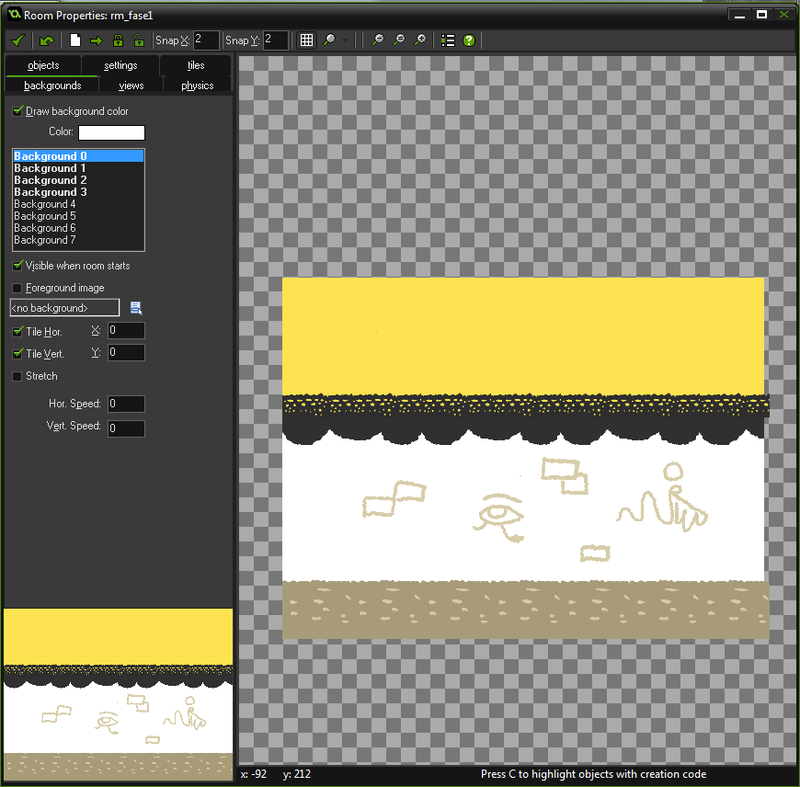 We're both taking the ideas as he draws and I try to do what I can with Game Maker. I play video games since I was a baby in the 80s and I have different types of games among my favorites. Today the games I like most are the "simple and innovative" type. 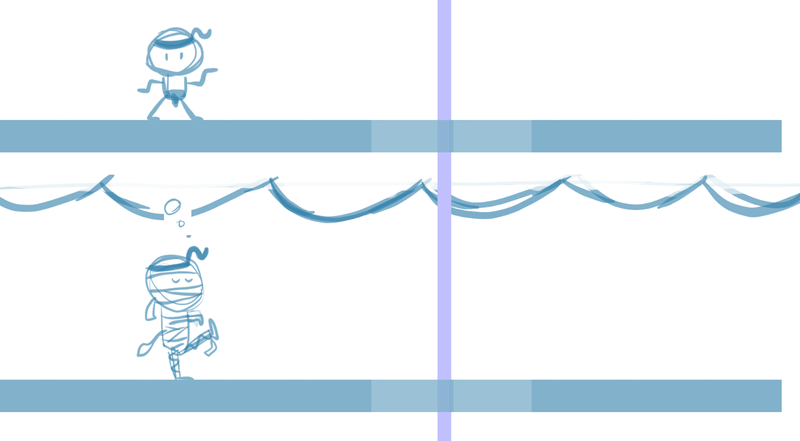 But for this Jam, I am letting myself be influenced by classical plataformers with a hint of personal creativity. What most excites me in game development is to allow that people can give life and movement to their imaginary worlds, including those kept alive in their heart since they were very young, whether adult, child or elderly.